Are you already susbscribed to our email newsletter? Great! If not, what’s stopping you? You get all the latest news from Fire Up Video, as well as some updates from our partner companies, Fire Up Creative, Creative Concepts, and more. It is the perfect way to see what new options we have for our customers, as we are always trying to keep up with (or stay ahead of) the newest LED screen and video technology. You never know when we may add something that could be a better fit for your event, or a new addition to create more excitement for your guests. We only send out a few emails per year, so you don’t have to worry about us filling up your inbox. The newsletters only come out when we have some big news or if we want to give an update if we haven’t talked in a while. Over the years, we have frequently added new screens, new technology, and started new companies. So there are some major moments and opportunities that you could be missing out on for your event. We will never sell your email or contact information to anyone. You can unsubscribe any time you want. But why would you want to? 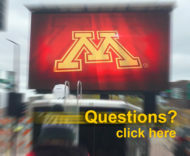 Fire Up Video provides mobile LED screen rentals to events all over the Midwest, including Indiana, Ohio, Tennessee, Kentucky, Missouri, Iowa, Illinois, Michigan, Minnesota, Wisconsin, North Dakota, South Dakota, Kansas, Colorado, Nebraska, and more. For more information pleast contact us at 844-533-8848 or baum3@earthlink.net.